Certain students face unique challenges when applying for financial aid. 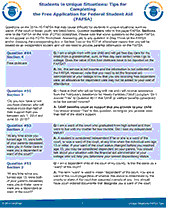 These tip sheets are designed to help unique student populations overcome these challenges to successfully navigate the financial aid process and access higher education. We encourage you to distribute these tip sheets to students and families.